After spring breaks, handy fathers are outside using their tools. This is the first spring in my new home, and I’ve noticed a few stumps in the yard. I mean to have them removed. Living in town, I’ve had no reason to own an axe. I had never done Axe Handle repair or replacement either. After borrowing an axe from my father’s garage, I got to work. Two of the stumps in my yard are mulberry, and have live shoots growing around a larger dead stump. The other stump is much larger, and I’m not sure of the species of tree. The technique I’ve always used for stump removal is to dig around the stump with a shovel. Then chop the supporting roots below ground level and remove the stump. Then I back fill the hole. 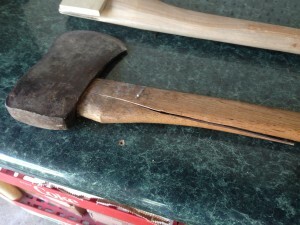 On this particular occasion, with a borrowed axe, the wood handle split from behind the axe head. Not only was the project unfinished, but I will not return a broken tool. Repairing an axe was just part of the plan anyway! Right? Not sure of the proper technique for the axe head removal, I just made one up. This was an older axe and had nails in the wood by the head. I think they were there to add thickness to the wedge. This helped the head from sliding off. Naturally I assumed that removing these nails would make removing the axe head easier. Removing and axe head from a broken handle. Remove any metal wedges and nails, then drill out some of the wood. This will make head removal much easier! It didn’t go as easily as I thought it would. I clamped the broken handle into my vice and tried beating the head off with a hammer. The wedge that held the head on was still in tact but wasn’t removable. I found that the easiest way to remove the axe head from a wooden handle is to drill out the wedge that holds the head on. I used a 5/16 inch spade bit to drill a series of holes. That worked like a charm! What I should have done next is take the axe head with me to the hardware store. I didn’t do that. I went to the hardware and picked the handle that I liked best. 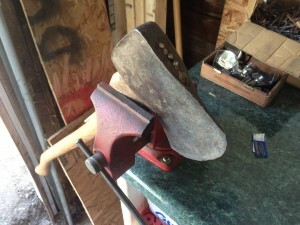 It turns out that some handles have a much large piece than what fits into the axe head. After a lot of trimming, I finally got the axe head on the new handle and have finished the first two, smaller stumps. Look for the stump removal post on the lawn & garden page soon!